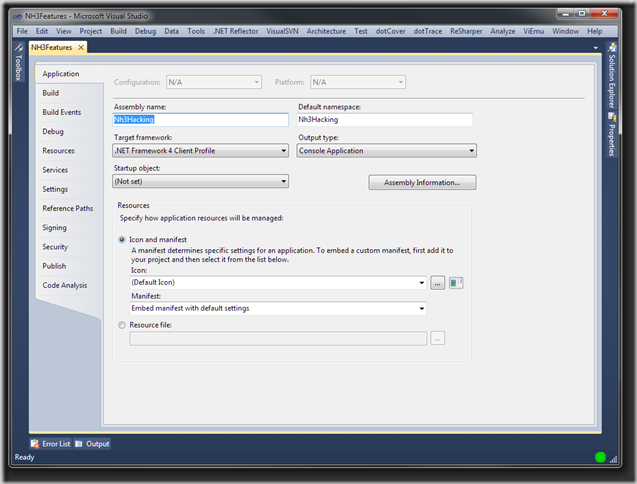 NHibernate 3 introduces support for both the .NET 3.5 Client Profile and .NET 4.0 Client Profile. This means that applications built with NHibernate can be deployed to client desktops without the full .NET Framework installed. Why hasn’t this been available all along? I haven’t done an exhaustive search of the NHibernate 2.X codebase looking for other dependencies on System.Web, but those two give you an idea of why supporting the .NET Client Profile wasn’t as simple as recompiling NHibernate 2.X. The team had to break some dependencies on assemblies not include with the .NET Client Profile while not breaking backward compatibility. For most developers, supporting the .NET Client Profile is as simple as switching the Target Framework on their assemblies. One word of warning… If you’re using NHibernate Profiler (and you should be), the NHibernateProfiler.Appender doesn’t support the .NET Client Profile because it requires log4net. You can use a preprocessor directive around the initialization line of NHibernate Profiler and then define that conditional compilation constant (using #define ENABLE_NHPROF) to enable/disable profiling. You’ll also have to change the target framework to .NET 3.5 or .NET 4.0 temporarily for the profiling session so that your project compiles. UPDATE: NHibernate Profiler build 796 and later supports profiling applications built against the .NET Client Profile. More information can be found here. Written by The Morning Brew – Chris Alcock » The Morning Brew #801 about 8 years ago. Written by Andrew Rea about 8 years ago. Thanks for the article. The change to the log4net dependency was of particular interest to me as just the other day I thought about getting nhib 3 to play with nlog . Cheers again. Written by .NET Client Profile Support in NHibernate 3 – NHibernate blog – NHibernate Forge about 8 years ago. Written by What’s New in NHibernate 3? at Calgary .NET User Group Wrap-up – James Kovacs' Weblog about 8 years ago.